The word “compassion” can best be translated into English using the word “proxy” meaning that another person can experience another person’s experience because we are all related by our inherent divinity given to each person equally. It is an all-inclusive experience where there is unity in the natural order and everyone is interconnected. Therefore, our spiritual work in ceremony can be done by proxy when sitting for a loved one and this process offers healing to all who are commonly afflicted. This is how our personal work is amplified and exponential. The wellness restoration template for our personal experience of healing is already built within us and within the spiritual realm of oneness. Social interaction in the context of what the Western system calls “the human condition” meaning pain and suffering in the state of physical plane living is a given. Then “compassion” means a deep empathy for the pain and suffering of others. In order to accomplish healing in this context the levels of mind-body dichotomy, compartmentalized thinking, dualism programing and individualism conditioning, must be named and the root cause identified to be corrected in the Emptying phase of a healing process for a reframe into the context of interdependence and oneness. 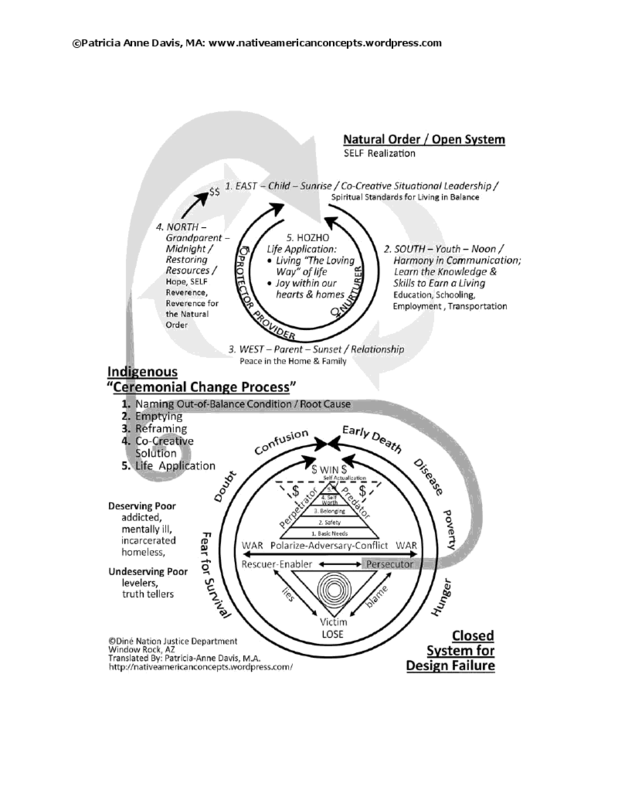 This entry was posted in Ceremonial Change Process, Native American Concepts and tagged compassion, healing process, human condition, interconnection, interdependence, oneness by Patricia Anne Davis, MA Choctaw-Navajo/Chahta-Dineh. Bookmark the permalink. Patricia Anne Davis has affirmed my understanding of life in so many ways, her insights are always astounding and humbling.